The 35th Infantry Regiment Association salutes our fallen brother, CPL Phillip J. Brodnick, who died in the service of his country on August 22nd, 2007 in Multaka, Iraq. The cause of death was listed as Helicopter Crash. At the time of his death Phillip was 25 years of age. He was from New Lenox, Illinois. There wasn't a cloud in the sky on the warm, sunny morning, but it was raining tears Saturday as family, friends and even strangers welcomed Army Cpl. Phillip J. Brodnick home one last time. Members of the Patriot Guard Riders, stand at attention as the casket carrying Army Cpl. Phillip Brodnick is led from St. Albert the Great Catholic Church in Burbank Saturday. The fallen soldier was ushered past police officers and soldiers who stood shoulder to shoulder with tear-stained cheeks as they bid their final farewells to the 25-year-old alongside his family and friends. 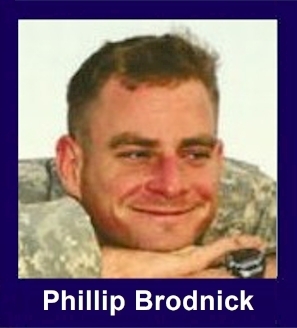 Brodnick was among 14 U.S. soldiers killed Aug. 22 in a Black Hawk helicopter crash in northern Iraq. "Through our tears, we need to grieve," the Rev. David Engbarth told a saddened audience that gathered for a Mass at Burbank's St. Albert the Great Catholic Church. "This sign of passing is such a reminder: Life is short," Engbarth said. "Decide today that Phil's passing will be for us a wake-up call not to live life in cynicism, bitterness or resentment (but) in love and service," he said. Service was something the Lincoln-Way High School grad took seriously since joining the Army at 18 years old. Brodnick was entrenched in his second tour when he was killed. In 2005, he re-enlisted after completing an assignment in Kosovo. In August 2006, he was deployed to Iraq and scheduled to be home in June, but his tour was extended until October, a reality his mother, Marian Stockhausen, said he was at peace with. "You read the paper, and you see a guy who hit a home run in the bottom of the ninth inning called a hero," said Lt. Gov. Pat Quinn who spoke at the Mass. "I don't think these are the genuine heroes of our time. It's people like Phil." A hero's homecoming is what Brodnick got during the pageantry that began at St. Albert and ended at his final resting place at Holy Sepulchre Cemetery in Alsip. Scores of Burbank, Oak Lawn and Alsip residents stood in their front yards and on street corners with hands across their hearts to show their respect as the seemingly unending caravan of cars in the funeral procession traveled past. Oak Lawn firefighters stood at attention with flags raised along Cicero Avenue near the corner of 103rd Street. And dozens of members of the Patriot Guard Riders motorcycle group also lent red, white and blue to the procession as flags waved from their motor brigade. Just before the bagpipes played a final round of taps, a military official awarded Brodnick a Bronze Star and an Army Good Conduct Medal through his family. Brodnick's father, James Brodnick, a 25-year Burbank police veteran, held his chin high as the family accepted honors on behalf of his son. He lowered his gaze, however, when a soldier handed him the flag that draped his son's casket. James Brodnick pulled the stars and stripes close and, for a brief moment, held them tight against his chest. Brodnick's mother hung her head low in mourning. "He was the glue that held us together," eulogized Brodnick's sister Kimberly Larson. His death will leave so many voids, she said: "brother, friend, son."